Not the oldest known pottery on Earth, which is from Southern China and dated c. 20,000 BP, but close enough: Paleolithic peoples of Japan (proto-Ainu?) used ceramic pots to cook fish some 15,000 years ago. Pottery was a hunter-gatherer innovation that first emerged in East Asia between 20,000 and 12,000 calibrated years before present1, 2 (cal bp), towards the end of the Late Pleistocene epoch, a period of time when humans were adjusting to changing climates and new environments. Ceramic container technologies were one of a range of late glacial adaptations that were pivotal to structuring subsequent cultural trajectories in different regions of the world, but the reasons for their emergence and widespread uptake are poorly understood. The first ceramic containers must have provided prehistoric hunter-gatherers with attractive new strategies for processing and consuming foodstuffs, but virtually nothing is known of how early pots were used. Here we report the chemical analysis of food residues associated with Late Pleistocene pottery, focusing on one of the best-studied prehistoric ceramic sequences in the world, the Japanese Jōmon. We demonstrate that lipids can be recovered reliably from charred surface deposits adhering to pottery dating from about 15,000 to 11,800 cal bp (the Incipient Jōmon period), the oldest pottery so far investigated, and that in most cases these organic compounds are unequivocally derived from processing freshwater and marine organisms. Stable isotope data support the lipid evidence and suggest that most of the 101 charred deposits analysed, from across the major islands of Japan, were derived from high-trophic-level aquatic food. Productive aquatic ecotones were heavily exploited by late glacial foragers3, perhaps providing an initial impetus for investment in ceramic container technology, and paving the way for further intensification of pottery use by hunter-gatherers in the early Holocene epoch. Now that we have shown that it is possible to analyse organic residues from some of the world’s earliest ceramic vessels, the subsequent development of this critical technology can be clarified through further widespread testing of hunter-gatherer pottery from later periods. While utilitarian pottery wares are now quite clearly determined to be a Chinese invention first of all (c. 20 Ka. 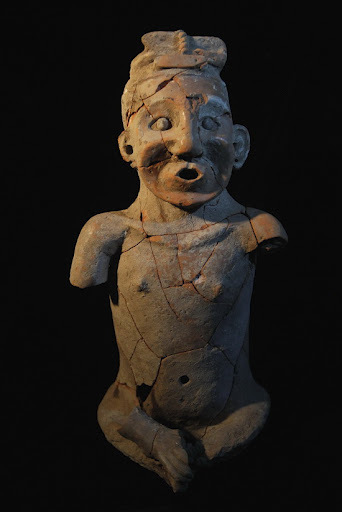 ago), Europeans were toying with clay and cooking it even earlier, with terracotta art known to have existed in Dolní Věstonice and other places since the Gravettian period. The site discussed in this new research is not as old but nevertheless it is interesting to mention because, as the authors say, it is becoming more and more clear that pottery was not a single punctual invention but that it was invented and maybe forgotten once and again in the course of human prehistory. The Croatian site’s ceramics begin only c. 17,350 years ago (cal. ), even if the occupation of the site is some two millennia older, and continues until some 14,400 years ago, when a tephra layer from the second Campanian Ignibrite eruption seems to mark a major hiatus in human habitation (the cave was later repopulated in the Epipaleolithic, c. 7400 BCE). The authors think that the Vela Spina figurines are similar to those from Pavlov and Dolní Věstonice in the creation process and most conceptual notions. However there are also some differences like stylized foots, lack of anthropomorphic figures and no direct correlation with hearths, as happens in Gravettian Moravia. See also: University of Cambridge press release. Hat tip to Pileta. A pottery or terracotta figure (right) from the Hongshan culture has been unearthed in what is now Inner Mongolia. The figure measures 55 cm height and is speculated to represent a sage or prince from the period. The Hongshan culture is (rather advanced, 3rd phase) Neolithic and believed to be proto-Koreanic or proto-Altaic by language. The figure is estimated to have an age of c. 5300 years ago. No wonder they call it “china”! Xianrendong cave, near the city of Shangrao (Jiangxi, SE China), has now the curious honor of hosting the oldest known specimens of pottery on Earth. The pottery shards from that cave were known since the 1960s (and later digs) but had not been properly dated yet. The result of such dating is the oldest known pottery on Earth, dating to the Last Glacial Maximum, that even in a subtropical region like Jiangxi must have caused some discomfort. Xiahong Wu et al., Early Pottery at 20,000 Years Ago in Xianrendong Cave, China. Science 2012. Pay per view. We already knew that the oldest pottery was from China (albeit from the North) and that it pre-dated agriculture… but we did not know it was so old.